Global stocks were set to post their best week of gains in six years on Friday after two consecutive weeks spent in the red, shrugging off a rise in global borrowing costs while the dollar hit its lowest level since 2014. The MSCI world index rose 0.4% after European bourses opened. .After suffering its biggest weekly drop since August 2015 last week, this week’s recovery puts the index on track for its best weekly showing since early December 2011. As Deutsche Bank notes, "The S&P 500 (+1.21%) rose for the 5th day and is now up +2.15% YTD which on a compounded annualised basis is c18.5%!! On this basis the NASDAQ (+1.58% yesterday, +5.11% YTD) is up c49.5% on an annualised basis." As Reuters notes, investors remain puzzled at this week’s quick rebound in stock markets, which has also coincided with a rise in bond yields on evidence that inflation is starting to creep up globally. The most frequent argument offered by economists has been that historically, it’s not unusual for stocks and bond market borrowing costs to rise in tandem with a rapidly expanding economy. In an especially quiet and illiquid overnight session, with most of Asia on holiday celebrating the Lunar New Year, FX traders saw fireworks in the latest violent lunges of the dollar, and especially the USDJPY, which tumbled as low as 105.55, taking out perimeter stops, and sending the pair to a fresh 15 month low, as the market shrugged off the widely-expected nomination of Haruhiko Kuroda (translation: no change to the BOJ's policy) for another term as the BOJ governor, while Japanese stocks closed 1.2% higher, ignoring the spike in the yen. of Renault (+3.1%), Eni (+1.5%), Allianz (-0.7%) and Vivendi (-5.8%) which have provided a bulk of the focus for traders thus far. Elsewhere, Vopak jumped after saying it has the potential to “significantly improve” its 2019 Ebitda, while Vivendi tumbled after posting earnings and confirming trends previously reported in January. 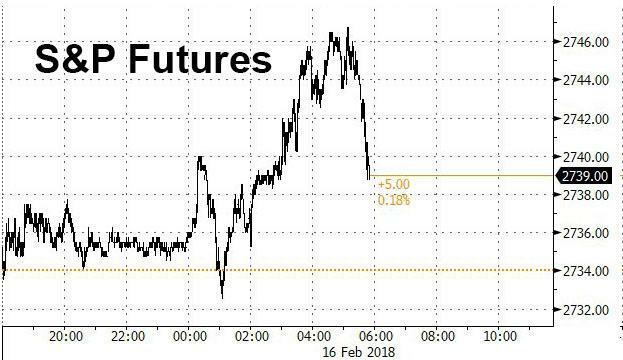 Over in the US, U.S. stock index futures rose, although were off session highs, signaling further gains on Wall Street as global equities continue to recover and bond yields fall back from recent peaks. So far in the rebound, the S&P 500 has recouped more than 50% of the losses suffered in the latest correction, the index is back above its 50-DMA and technical breadth is rising. Bit the biggest mover so far was the dollar came under early pressure as the Lunar New Year kept liquidity below average, as greenback sellers found limited resistance in pushing the currency lower before a long weekend in the U.S. In the process, the euro hit a fresh three-year high, while the yen seems determined to check barrier defense at 105.00. 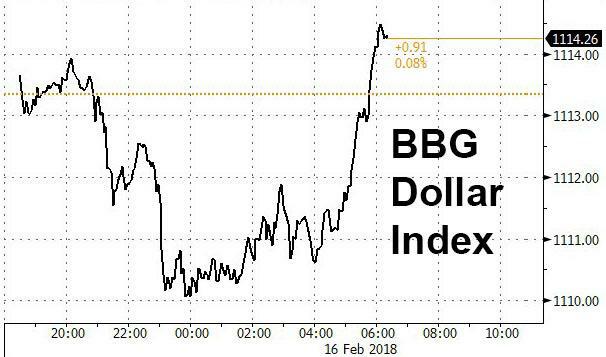 However shortly after the European open, the mood reversed completely, and the dollar saw a strong bid amid what some speculated was a broad round of dollar short covering, sending the BBG dollar index to session highs. There is no strong consensus yet on what is driving the dollar’s persistent weakness, especially in light of rising yields. Some say it simply reflects a return of risk appetite and a shift to higher-yielding currencies, including many emerging market ones. But others cite concerns that Washington might pursue a weak dollar strategy as well as talk that foreign central banks may be reallocating their reserves out of the dollar. There are also worries President Donald Trump’s tax cuts and fiscal spending could stoke inflation and erode the value of the dollar. “His protectionist policies could also fan inflation. Markets appear to have calmed down for now but fundamentally it is different from last year,” said Yoshinori Shigemi, global market strategist at JPMorgan Asset Management. “You could say that right now, rather than stocks rising around the world, it is the dollar falling against almost everything,” he added. Benchmark Treasury yields halted their surge at around 2.9% and the dollar paused after falling to a three-year low against major peers. Failing to break above 2.90%, the yield on the 10Y Treasury has instead tested the downside, and was currently trading just north of 2.88%, which has proven a support level over the past 48 hours. Even with borrowing costs on the rise, investors seem once again unconvinced they’re not yet at levels that would hinder equities as economic growth accelerates. While a larger number of economists forecast the Federal Reserve to step up its pace of interest-rate increases, that’s not helping the greenback, and as Bloomberg again highlights, the U.S.’s twin deficits have become a likely catalyst for a renewed wave of dollar-selling after February’s brief rally. In other news, the White House urged the House to advance the Goodlatte immigration proposal after 4 bills were defeated in the Senate. Former Trump campaign adviser Gates is said to be nearing a plea deal with Special Counsel Mueller with negotiations having taken around a month already. The UK’s IOD has put forward a bespoke Brexit solution which it believes will protect manufacturers from customs chaos but also allow the UK to strike independent trade deals. UK Retail Sales disappointed, rising on 0.1 M/M% vs. Exp. 0.5%. Elsewhere, crude oil rose to a one-week high as the greenback’s slump increased the appeal of dollar-priced commodities. Bitcoin pared earlier gains, failing to hold above $10,000, while South Africa’s rand held near a three-year high as newly elected President Cyril Ramaphosa prepares to deliver his state-of-the-nation speech Friday. Stock markets were quiet in Asia with most the region away for Lunar New Year holiday, while the few bourses which were open seemed to have joined in on the celebratory tone and initially took impetus from a 5th consecutive win streak on Wall St. As such, ASX 200 (-0.1%) was positive for most the day with earnings in focus, although upside was capped and later reversed amid profit taking in mining-related sectors. Nikkei 225 (+1.2%) continued to defy the recent JPY strength and outperformed as participants widely anticipated the Japanese government nominations for Kuroda to serve a 2nd term and 2 more doves for the Deputy Governor roles, while markets in China, Hong Kong, Taiwan and Singapore were among the mass holiday closures. Finally, 10yr JGBs were higher as Japanese yields retreated across the curve and which also followed the gains in USTs during the prior session, while the enhanced liquidity auction for longer-dated bonds failed to impact prices with the results broadly in line with the prior. Japan submitted nomination for BoJ Governor Kuroda to stay on for another term, while it also nominated reflationist academic Wakatabe and BoJ’s Amamiya as Deputy Governors. European equities (Eurostoxx 50 +0.9%) trade higher across the board after what was another firm close on Wall Street (S&P 500 +1.2%). All ten sectors trade in positive territory with outperformance in utility names following stellar earnings from EDF (+6.2%), subsequently dragging other names in the space higher. Elsewhere, energy names are performing well as prices remain supported by the softer USD. This morning’s equity newsflow has been largely dominated by a busy slate of earnings from the likes of Renault (+3.1%), Eni (+1.5%), Allianz (-0.7%) and Vivendi (-5.8%) which have provided a bulk of the focus for traders thus far. In currencies, the Yen's flight continues to compound the Dollar’s plight amongst G10 majors, but the Greenback remains a broader loser as EM currencies and commodities also prosper amidst the latest Usd sell-off. The DXY only just held above major Fib support at 88.250 overnight as Usd/Jpy selling eased up ahead of 105.50. However, only mild verbal acknowledgment of the largely one-way tide from Japanese officials, and no mention of intervention inspired a tame or token rebound to around 106.00 before the slide resumed. The Aud and Nzd are now looking at 0.8000 and 0.7450 vs their US counterpart, while the Eur has eclipsed its previous 2018 peak to trade just above 1.2550 and a few pips over the 1.2551 100 MMA having surpassed the 200 version (1.2453) on the way. Stops are said to waiting on a break of 1.2570, ahead of the next upside tech target at 1.2598, but a decent 1.2550 option expiry (1 bn) may keep the pair in check. Cable has now advanced through 1.4100 and almost hit 1.4144, with price action relatively contained following this morning’s below-expectation UK retail sales release. Usd/Chf is seriously testing the 0.9200 handle, with 0.9175 in sight. Japan's Chief Govt. spokesman said the FX market has shown one-sided moves recently. He added no need to change government stance on FX however no comments were added on whether appropriate measures include FX intervention. In commodities, WTI and Brent crude futures continue to benefit from the softer USD with prices eyeing USD 62.00bbl and USD 65.00bbl to the upside respectively despite forecasts for a continuation of surging US production and a slew of markets currently shut in Asia; Baker Hughes set to take focus in the latter stages of the session. In metals markets, gold is on course for its largest percentage rise in two years as the softer USD and buying ahead of the Chinese Lunar New year dictated a bulk of the price action. Elsewhere, copper has also benefited from the aforementioned currency swings and global manufacturing picture with prices on track for their largest gain in over a year. Looking at the day ahead, there is January retail sales data in the UK this morning. In the US, the January import price index, housing starts and building permits along with the preliminary February University of Michigan consumer sentiment reading are also due. Elsewhere, the ECB’s Coeure will speak and Coca- Cola and Kraft Heinz will report their earnings. Another day, another higher inflation print largely ignored by the market. This time it was US core PPI that beat (0.4% mom vs 0.2% expected). As DB’s Matt Luzzetti highlighted the standout in the report was an incredibly strong reading for health care PPI, which is used to estimate the health care component of the PCE price index - the Fed’s favoured gauge. Health care PPI was up 0.68% m/m on a seasonally adjusted basis, the strongest print since the first reading of this series in Jan 2007. The data implies a sharp jump in the yoy rate for health care PCE inflation from about 1.5% to 2.2%. Matt went onto say that Wednesday’s CPI data and yesterday’s health care PPI data are consistent with a very strong core PCE print for January (+0.3% m/m), which would lift the 3m and 6m annualized inflation rate above 2%. So the inflation narrative builds and builds. This story and its’ impact on markets won’t go away in our opinion and we might just be ignoring it as we normalise from last week’s shock. The S&P 500 (+1.21%) rose for the 5th day and is now up +2.15% YTD which on a compounded annualised basis is c18.5%!! On this basis the NASDAQ (+1.58% yesterday, +5.11% YTD) is up c49.5% on an annualised basis. Within the S&P, all sectors but energy rose, with gains led by the utilities and tech stocks. The VIX (-0.67%) fell for the 5th day and closed at 19.13. 10yr Treasuries initially rose in yield after the PPI report and at the highs of session (2.942%) they were a good 14bps higher than just before Wednesday’s CPI. However a rally to 2.91% by the close left yields just 0.7bps higher on the day. Elsewhere, Bund (+0.7bp) and Gilt (+0.5bp) 10y yields were little changed, while peripherals outperformed modestly with yields down 3bp to flat. 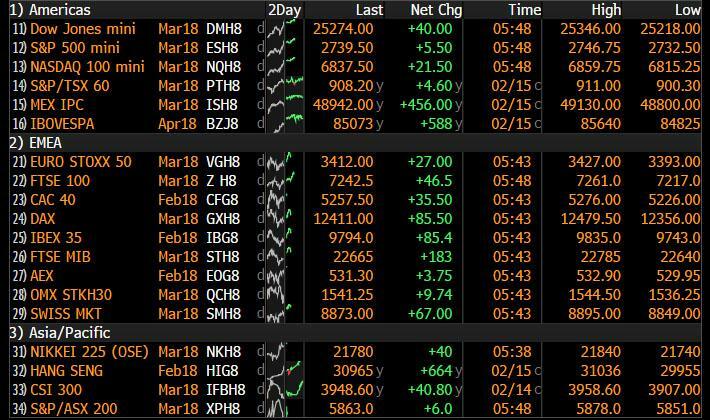 This morning in Asia, the Nikkei (+1.35%) is up while the ASX 200 (-0.08%) is marginally lower, while most other bourses are closed for Chinese New Year holidays. In Japan, the parliament has officially reappointed the existing BOJ Governor Kuroda for another five year term, as widely expected. The YEN is marginally higher this morning. There’s been a fair amount of discussion in markets this week over the well cited story from Bloomberg that Bridgewater Associates (the largest hedge fund in the world) now has a $22bn short position on European stocks. Obviously when a major global player does this you have to take notice. Staying in this asset class, DB’s European equity strategist Sebastian Raedler has argued in a note this morning that the recent equity market sell-off in the US and Europe was due to rising real bond yields. Yet, given that Euro area growth momentum is still supportive, the sell-off in European equities seems excessive, with the Stoxx 600 now trading around 7% below the fair-value level implied by his tactical model (375 versus an implied fair-value at 400). Yet, Sebastian remains tactically neutral on the market, as he expects fair-value to fall to 365 by mid-year on the back of a likely fade in Euro area PMIs over the coming months (driven by the lagged impact of EUR strength and a less favourable inventory cycle). He argues that the main downside risk for European equities is that real bond yields continue rising. If they increase by a further 50bps by mid-year, in line with our rates strategists’ projections, this would lower the implied fair-value level for the Stoxx 600 to around 345 (7% downside from current levels). See the note here for more details. Flipping over to credit, yesterday Michal Jezek in my team published a report “Credit Derivatives Update: Positioning, Pricing and Long CDS/Short TRS in EUR & USD IG”. Firstly, the piece offers a concise summary of the latest positioning data in European and US CDS indices, given the extreme swings last week. Secondly, it provides a brief comment on the latest repricing of CDS indices and options. And finally, it argues that recent hedging via CDS has made CDS cheapness relative to cash bonds even more extreme. Michal reiterates his earlier macro credit trade idea that takes advantage of the currently dislocated CDS-bond basis. You can download the report here. Now recapping other markets performance from yesterday. European bourses were all higher, with the Stoxx 600 (+0.53%) up for the second day and gains driven by materials and tech stocks. Across the region, the CAC led the gains (+1.11%) while the DAX (+0.06%) and FTSE (+0.29%) advanced modestly. Turning to currencies, the US dollar index weakened for the fourth consecutive day (-0.59%; -3.8% YTD), while the Euro and Sterling gained 0.44% and 0.71% respectively. In commodities, WTI oil rose 1.35% to $61.42/bbl while precious metals consolidated on their larger gains from the prior day (Gold +0.22%; Silver +0.05%). Back to currencies, DB’s Saravelos has been getting numerous enquiries as to how can it be that US yields are rising sharply, yet the dollar is so weak at the same time? He believes the answer is simple: the dollar is not going down despite higher yields but because of them. Higher yields mean lower bond prices and US bonds are lower because investors don't want to buy them. This is an entirely different regime to previous years. Before we take a look at today’s calendar, we wrap up with other data releases from yesterday. In the US, the February Philly Fed business outlook index was above market at 25.8 (vs. 21.5 expected) while the empire manufacturing index fell 4.6pts mom to 13.1 (vs. 18 expected). Notably, the latter reading is still in expansionary levels and the new orders and employment indices both firmed, as did the six-month ahead outlook for business conditions. Elsewhere, the January IP fell 0.1% mom (vs. 0.2% expected), weighed down by lower mining activity, while capacity utilisation was also below expectations at 77.5% (vs. 78%). Finally, the February NAHB housing market index was in line at 72, while the weekly continuing claims (1,942k vs. 1,925k expected) and initial jobless claims (230k vs. 228k expected) were both higher than expectations. In Europe, France’s 4Q unemployment rate was lower than expected at 8.9% (vs. 9.5%) - the lowest unemployment rate since 1Q 2009. The Euro area’s December trade surplus was slightly above market at €23.8bln (vs. €22.3bln), while the final reading for Spain’s January inflation was unrevised at 0.7% yoy.